Russ Blunt's coaching career included four sports and an amazing six decades, but this 1936 graduate of St. Augustine's College really made his mark in track. 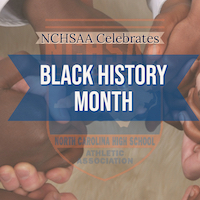 He built a dynasty at Hillside High School in Durham, winning 10 state championships in the old North Carolina High School Athletic Conference (NCHSAC) and then winning or sharing several state titles in NCHSAA competition in indoor and outdoor track. During one 12-year period his high school track teams lost only two dual meets and at one point he was acknowledged by USA Today as the oldest active high school coach in the country. As a head football coach, Blunt guided his teams to five conference championships. His stops for high school coaching included Hillside and Southern Durham, and collegiately he coached at St. Augustine's, St. Paul's, North Carolina College (now North Carolina Central), Florida Memorial and Southern University. He was inducted into the North Carolina High School Athletic Association Hall of Fame in 1989 and was the second North Carolinian to join the National High School Hall of Fame six years later. He also was recognized as one of the “100 To Remember” coaches during the NCHSAA’s 100th anniversary. The football stadium at Hillside High School is named in his honor. Blunt died in 2004.